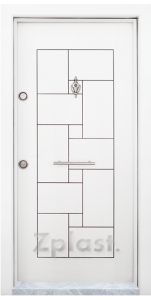 Stylish metal entrance doors from Z Plast. This model entrance door is made of 1.5 mm powder coated metal and milled MDF panels with laminated cover. 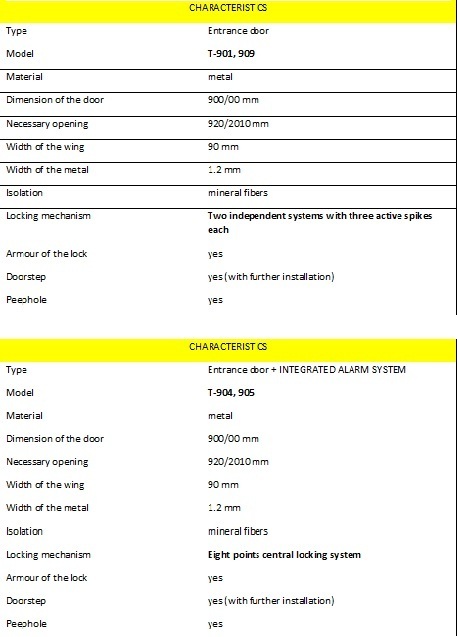 The dimensions of the door frame are 90/200 cm. The wing is 9 cm thick. The opening directions are: from outside/right, outside/left, inside/right, inside/left. The door is sound and heat insulated with mineral wool and additional ribbing. The frame can be adjusted to wall 34 cm. 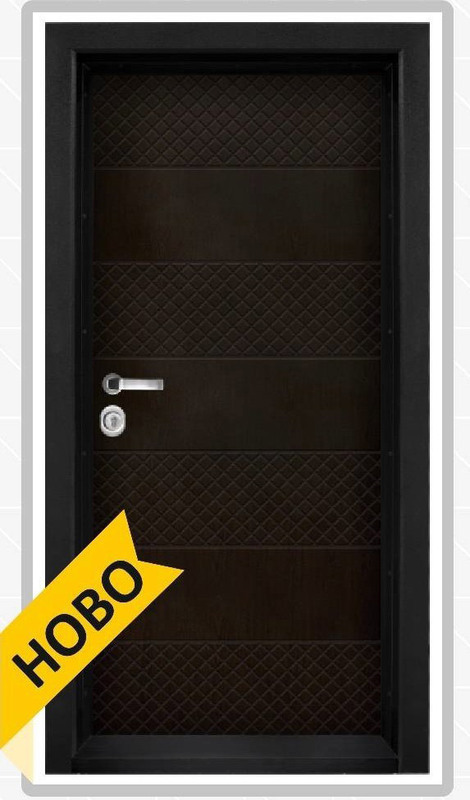 The door is equipped with two locking systems with three active spikes, there is a third hidden lock inside resembling a latch. 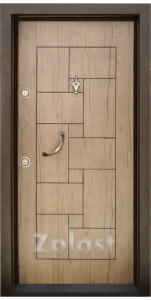 The price of the door includes: wing, frame, fitting, handles, 3 adjustable hinges, peephole, two lock cylinders with three keys. Additionally there is an armour of the lock cylinder against break, on the side of the hinges, the wing is reinforced with eight passive spikes, which when the door is closed enter into the frame. This model entrance door is made of 1.5 mm powder coated metal and milled MDF panels with laminated cover. 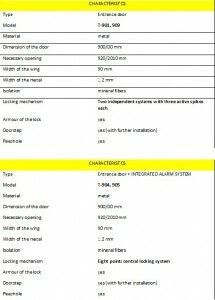 The dimensions of the door frame are 90/200 cm. The wing is 9 cm thick. The opening directions are: from outside/right, outside/left, inside/right, inside/left. 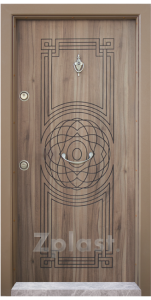 The door is sound and heat insulated with mineral wool and additional ribbing. The frame can be adjusted to wall 34 cm. The model has a high degree of protection, with eight point lock (seven active spikes in the sides and one above) + third hidden lock from the inside, resembling a latch. 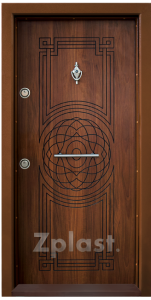 The door is equipped with two locking systems with three active spikes, there is a third hidden lock from the inside resembling a latch. This model entrance door is made of 1.5 mm powder coated metal and milled MDF panels with laminated cover. 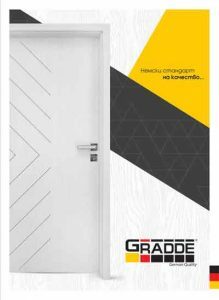 The dimensions of the door frame are 92/200 cm. The wing is 7 cm thick. The opening directions are: from outside/right, outside/left, inside/right, inside/left. The door is sound and heat insulated with mineral wool and additional ribbing. The frame can be adjusted to wall 34 cm, but also up to 40 cm, which is paid supplementary. 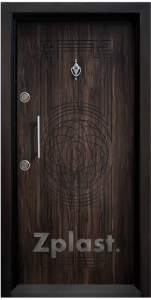 The door is equipped with two locking systems with three active spikes, there is a third hidden lock from the inside resembling a latch. 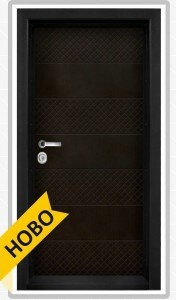 The price of the door includes: wing, frame, fitting, handles, hammer, peephole, two lock cylinders with three keys. Additionally there is an armour of the lock cylinder against break. This model entrance door is made of 1.5 mm powder coated metal and milled MDF panels with laminated cover. 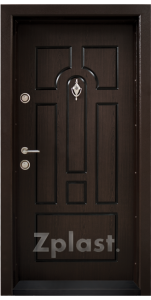 The dimensions of the door frame are 92/200 cm. The wing is 7 cm thick. The opening directions are: from outside/right, outside/left, inside/right, inside/left. The door is sound and heat insulated with mineral wool and additional ribbing. The frame can be adjusted to wall 34 cm, but also up to 40 cm, which is paid supplementary. 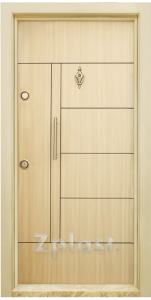 This model entrance door is made of 1.5 mm powder coated metal and 10 mm milled MDF panels with laminated cover. 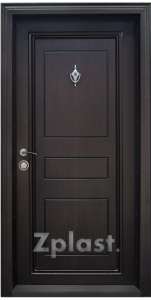 The dimensions of the door frame are 92/200 cm. The wing is 70 mm thick, and the possible opening directions are: from outside/right, outside/left, inside/right, inside/left. The door is sound and heat insulated with mineral wool and additional ribbing. The frame can be adjusted to wall 34 cm (with the option to be extended to up to 40 cm, which is paid supplementary). 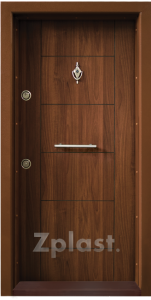 The door is equipped with two independent locking systems DAF single block with three active spikes, and a third hidden lock resembling a “latch” from the inside. The wing is 70 mm thick, and the possible opening directions are: from outside/right, outside/left, inside/right, inside/left. The door is sound and heat insulated with mineral wool and additional ribbing. The frame can be adjusted to wall 34 cm (with the option to be extended to up to 40 cm, which is paid supplementary). 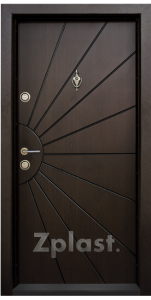 The door is equipped with two independent locking systems DAF single block with three active spikes, and a third hidden lock resembling a “latch” from the inside against break. 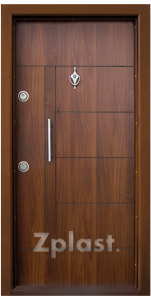 This model entrance door is made of 1.5 mm powder coated metal and 10 MM milled MDF panels with varnished cover. 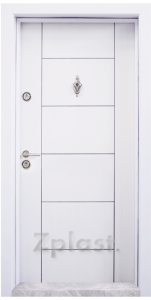 The dimensions of the door frame are 92/200 cm – wall up to 34 cm and 86/197 cm – wall up to 21,34 cm. 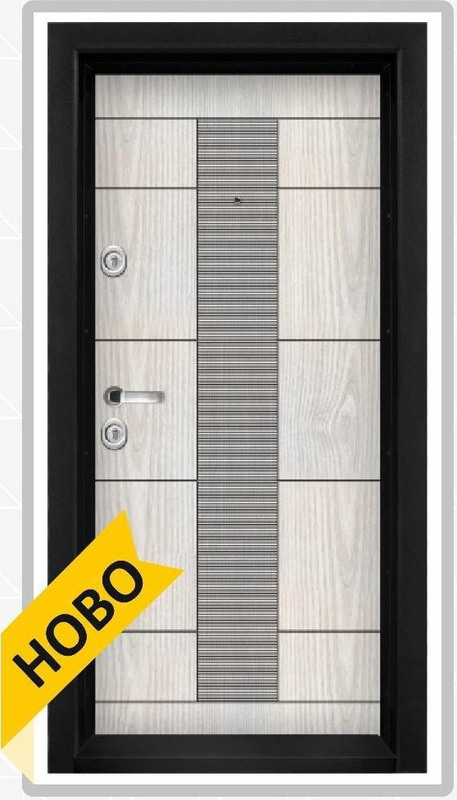 This model entrance door is made of 1.5 powder coated metal and 10 mm milled MDF panels with varnished cover. 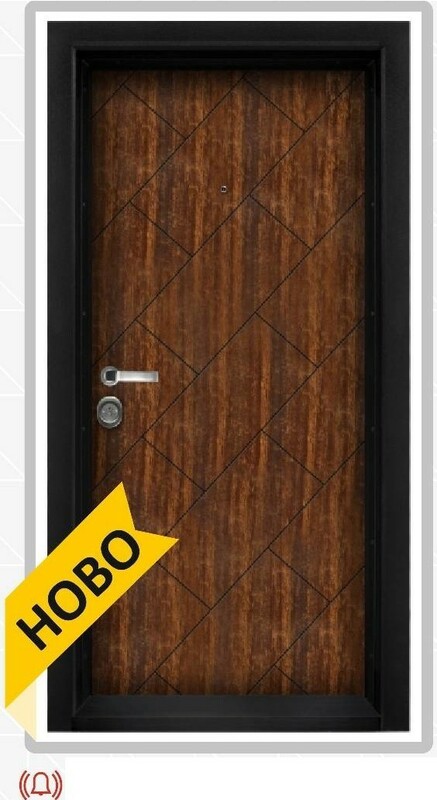 The dimensions of the door frame are 92/200 cm – wall up to 34 cm and 86/197 cm – wall up to 21,34 cm. 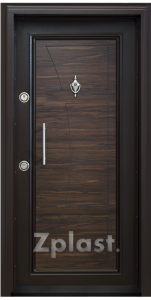 This model entrance door is made of 1.5 mm powder coated metal and 10 mm milled panels with varnished cover. 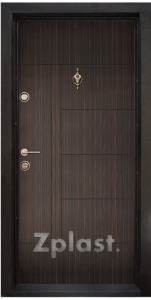 The dimensions of the door frame are 92/200 cm. The frame can be adjusted to wall 34 cm, but also up to 44 cm, which is paid supplementary. The wing is 7 cm thick. The opening directions are: from outside/right, outside/left, inside/right, inside/left. The structure of the wing represents two polished MDF panels; for sound and heat insulation is used polystyrene. 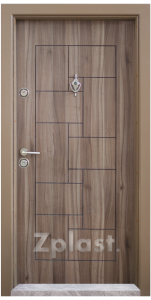 The door is equipped with one locking systems DAF single block with three active spikes. 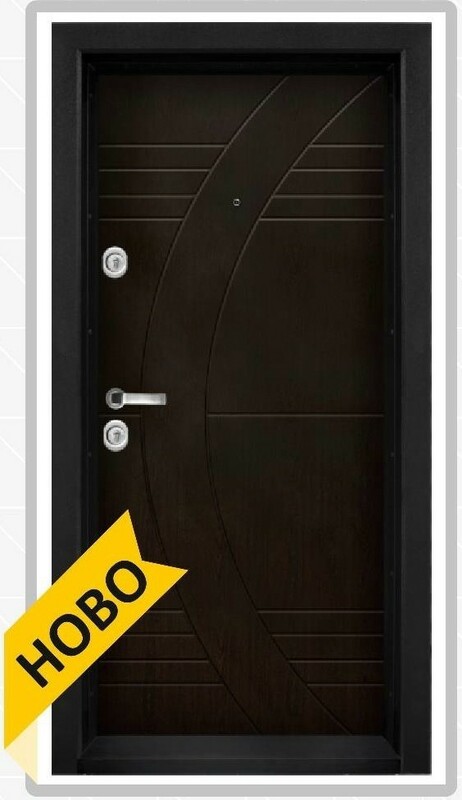 The price of the door includes: wing, frame, fitting, handles, hammer, peephole, two lock cylinders with three keys, armour of the locking cylinder and a concave cap against breaking. 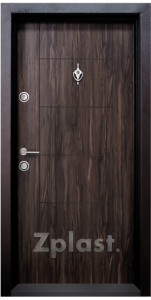 This model armoured door is made of 1.5 mm powder coated metal and 10 mm milled panels with laminate cover. 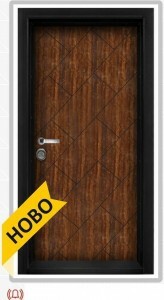 The dimensions of the door frame are 92/200 cm. The frame can be adjusted to wall 34 cm, but also up to 44 cm, which is paid supplementary. The wing is 7 cm thick. The opening directions are: from outside/right, outside/left, inside/right, inside/left. The structure of the wing represents two polished MDF panels; for sound and heat insulation is used polystyrene. 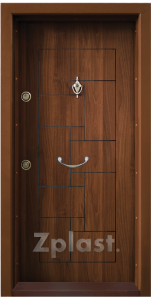 The door is equipped with two locking systems with three active spikes. 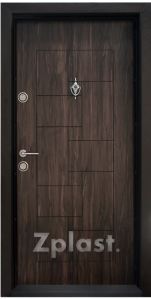 The price of the door includes: wing, frame, fitting, handles, hammer, peephole, two lock cylinders with three keys, armour of the locking cylinder and a concave caps against breaking.